We’re going to be heads-up on the turn in position considering a semi-bluff all-in. 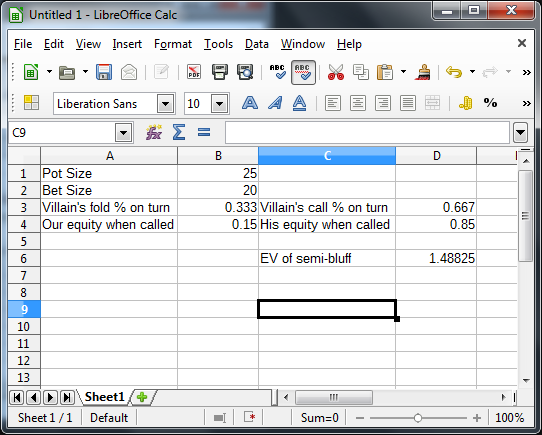 To evaluate the EV of the semi-bluff itself, you’ll need to know the size of the pot, the size of the remaining stacks, the chance Villain folds and our equity if Villain calls. Next week, we’re going to look at the answer to this homework, and we’re going to start working out what the EV of checking would look like in that particular scenario. Villain folds, we profit the pot. Villain calls, we win the hand, we profit the pot plus the bet size. Villain calls, we lose the hand, we lose the size of our bet. Remember that last week we discussed how our left column is going to be for values that we put in ourselves, and our right column is going to be for values that we have calculated automatically by the spreadsheet. 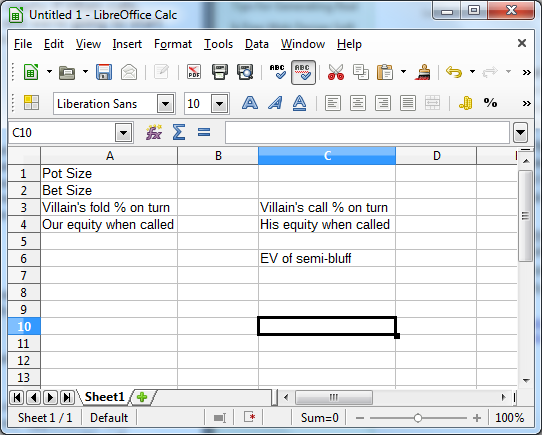 For this right-hand column, we need to put in some formulas so that the three values we’ve listed are calculated. In cell D3, we want to put in “=1-B3” without the quotes. This will subtract the fold percentage from 100 percent to give us the call percentage. Along similar lines, in cell D4, we want to put in “=1-B4” without the quotes. This will give us our opponent’s equity by subtracting our equity from 100 percent. It’s the same idea as the fold/call percentages. Now we’re just going to put in the cell values for each of those so that the formula makes sense, and we’re going to keep the equals sign at the front of it so that the spreadsheet knows that it’s a formula to calculate automatically and not just some random crap we’ve typed in. We have two different options here: semi-bluffing and checking. We have to be able to calculate the EV of checking as well if we want to know which of our two options is correct. What makes this extra fun is that there are different ways we can play our hand after checking, and each of those will have its own EV. 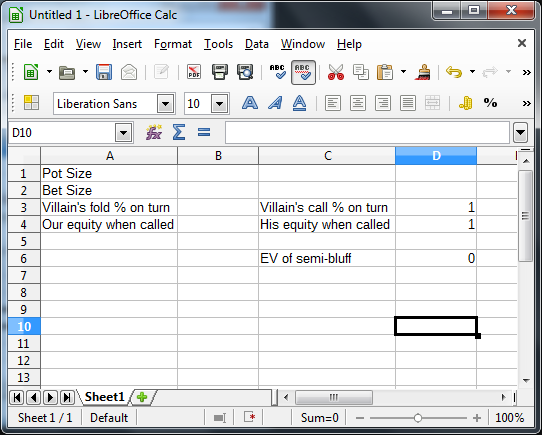 If we miss our outs and our opponent checks to us, we need to decide on the EV of checking against the EV of bluffing. Note that we have already made a spreadsheet to determine the exact EV of this exact situation last week when we looked at bluffing all-in in position on the river. Note that we also need to know how often he’s going to bet if we miss our outs and we don’t get an opportunity to bluff him on the river. If we hit our outs and our opponent checks to us, we will always bet, but we’ll need to know how often he’ll call and how often he’ll fold to us after that. We also need to know about how often we think he’ll bet into us if one of our outs does hit on the river. This is going to lead to a lot of complications.